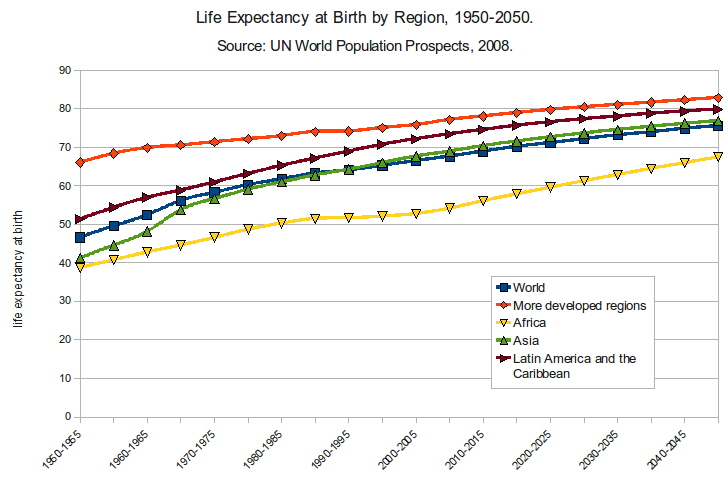 All over the developed world people are living longer. And it is a trend that looks certain to continue. Obviously, this will affect many areas of life, from work and pensions to relationships and mental health. Like it or not, people are going to have to adjust to longer and longer lifespans. It is interesting to observe the way journalists cover stories dealing with life extension. Until very recently, when a scientist appeared on a major news network suggesting that ageing might be slowed and lifespans extended, he was treated in a light, patronizing, even mocking way. In the last decade or two this has changed. Distinguished scientists are now taking the matter seriously and articles have begun appearing in the most respected papers and magazines (in August 2016, for example, The Economist printed the image of an hourglass on its front cover, beneath the heading “cheating death: the science that can extend your lifespan”). First, it must be said that though life expectancy has increased over the last hundred years, this is due to things like improved diet, sanitation, hygiene and lower infant mortality rates rather than life-extending medication. But this is set to change. Professor David Sinclair of Harvard, for example, has developed the NMN tablet to slow ageing down. So confident is he of its effect that he has given it to his 77-year-old father. Professor Michael Bess, in his book Super Humans, settles on a “life expectancy of about 160 years” and is sure this will happen over the next few decades. The age at which people can retire will certainly have to be pushed back and back. No doubt those who dislike their job will be horrified by the prospect of another 70 or 80 years mouldering in the accounts department or trying to teach math to bored teenagers. Then of course there is the additional problem of workplace mobility. If people remain working for 80 years or more, they are going to accumulate a great deal of experience and skill, so much in fact that it will be difficult to justify replacing them with someone younger. This will in turn mean fewer and fewer chances for promotion, which will mean a loss of motivation for those who have just started. That brings the additional problem of “institutional stagnation.” If society’s teachers, professors, physicians, managers etc. refuse to make way for their younger colleagues, the school, hospital, or corporation will lack fresh ideas and fresh perspectives. The young are also more in tune with the changing world and thus better placed to update the institutions in which they work. As people age, they often fail to keep pace with such changes. If there are to be longer lifespans, then the very idea of a job for life may disappear. Institutions may employ and promote people on the understanding that this is not permanent but is for a fixed length of time. People will therefore need to be more flexible and develop new skills. Governments must also be prepared to invest in re-training, providing the money so that a lorry driver replaced by a self-driving vehicle, or a professor forced to make way for a younger colleague, can pay their rent while they retrain. Then of course there is the question of relationships. Many people struggle to maintain a happy, lively relationship for three or four decades, let alone 10! Could you really listen to the same old jokes and opinions for 100 years? Perhaps the very idea of monogamy will be challenged, coming to be seen as something quaint and old-fashioned – like exchanging locks of hair or asking a father for his daughter’s hand in marriage. Indeed, it is already happening among the so-called “silver splitters”: couples in their 60s who are now separating in record numbers (despite a fall in the overall divorce rate). Of course, romantic relationships are not the only kind that will be affected. If the lifespan really is extended to 130, 150, maybe even 200, will people begin to see their parents in a different light and form new kinds of relationships with them? If it proves possible not only to extend the lifespan but to restore energy and looks, it may be more common to see your parents remarry, not just once but several times. It may also be common for people to start more than one family. The period of fertility will be extended, which will mean more half-siblings, possibly born 20, 30, or 40 years apart. People may even begin to lose track of who is related to whom. And there will be new forms of personal relationship to deal with. People will live to see their great grandchildren, maybe even their great, great grandchildren. If there is a clash of values between a 75-year-old grandmother and her 17-year-old granddaughter, what will it be like between a 130-year-old and her 17-year-old great, great granddaughter? And how would a teenager feel about a 60 or 70-year-old mother? Then of course there is the question of when, and even if, people have children. Though it may sound cynical, many people do have children because they fear a lonely old age. What if the lifespan is pushed to 130, even 150? Would a 30-year-old who loves her career and is enjoying her life want to start a family? Women who enjoy their careers will often delay marriage and motherhood, then panic and settle with a man they are unsure of. If this brought with it the prospect of 100 years together, they may be far more cautious. Even if problems like overpopulation are solved, won’t people grow bored? Education will be key. If the lifespan is to be extended and people really are going to live into their twelfth or thirteenth decade, there must be a fundamental change in attitudes. The idea that education begins at three or four and ends at 16 or 21, has to go. And so must the idea that education is simply a preparation for the workplace. But education is only half the battle, merely providing people with the tools. No matter how well-educated someone may be, if they lack curiosity and imagination it will not save them from boredom. Never before has the average person had access to so much wonderful and fascinating information. But they will need to be more willing to explore and try new things and to take an interest in subjects that once intimidated or bored them. Arts graduates should explore things like astronomy and zoology, while physicists could visit art galleries and read more poetry. More than anything, people are going to have to get used to change. Put simply, the longer you live, the more things happen to you. Someone born into an ordinary working family in Europe or North America in the middle of the 19th century could expect to live to their late 60s, maybe early 70s. He would probably remain in the town in which he was born, doing the job to which he was apprenticed in youth – maybe even working in the same building or field from his teens until his death. His 21st century descendants, on the other hand, may have to adapt to several marriages, numerous career changes, new groups of friends, maybe even new lives in new cities, countries, or cultures. Whether people choose to embrace all this as an exciting opportunity, or resent it as an unwanted burden, is up to them.